E-cooperative is the hottest online money making program, this scheme has gain the interest of many Nigerians because of the clear structure of the program and the start up money is not as big as other online peer to peer programs. Here I will discuss everything you need to know and how to join the e-cooperative online investment program. E-cooperative is a simple system that enable members raise the money they seek for any business project, make money from their venture, show them ideas on how to manage the money they have made, and of course show them how that money can be multiplied using various financial instruments. There are two sides to ecooperative and you can choose which one you want to be involved in. The first side is the multilevel part of e-cooperative. The second side is the business part. Some of the services that ecooperative renders are – Fundraising through cooperative, Online and offline business development, Internet marketing and training, Online Advertising, Agro-economic ventures, Financial Empowerment services, Hire purchase service, Micro-credit, eCommerce/Online Shopping and Skill Acquisition training. It works with a 4 x 4 forced matrix and is very simple to get involved in. It is a transparent, member to member payment scheme or cooperative that enables you raise the money that you need for your business. What the 4x4 forced matrix means is that you have to invite four persons to join you in e-cooperative. Those four persons have to invite four persons each, making it 16. The 16 persons have to invite 4 persons each summing up to 64. The resultant 64 have to invite 4 persons each, making 256. The matrix is thus - 4, 16, 64 and 256. NOTE: The system will merge people under you from your sponsor's spillover. NOTE: You begin the business with just ₦1,000. Joining e-Cooperative is absolutely free. However, to be part of the network of people who are developing themselves and building their wealth through e-cooperative, you need a sponsor. Register through this link here. A sponsor is someone who invited you and is already in the network. He has a referral link in which you can register. You are to contribute ₦1000 into your sponsor’s business. For you to be part of this business, you need the following. You give Jane [your sponsor] ₦1,000 and invite 4 persons to join you in the cooperative. This four persons will give you ₦1,000 each amounting to N4,000. To move to level 2, you CLICK on upgrade and Anie’s account details appear. 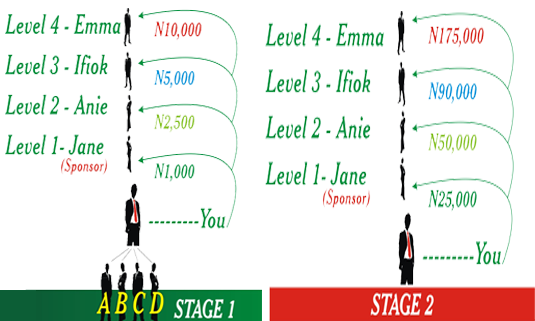 Note that the figurative Anie in the above diagram is the person who brought your sponsor [Jane]. You give ₦2,500 to Anie, and when the 16 persons that your initial 4 persons want to upgrade to level 2, you will receive ₦2, 500 from each 16 persons. What that means is that you will earn ₦40,000. When you give Ifiok [the third person above] ₦5,000, you will receive ₦320,000 from your 64 persons when they are moving up to level 3. When you give Emma [the fourth person above you] ₦10,000, your 256 persons when moving up to level 4 will give you ₦10,000 each summing up to ₦2,560,000. The second stage is automatic. 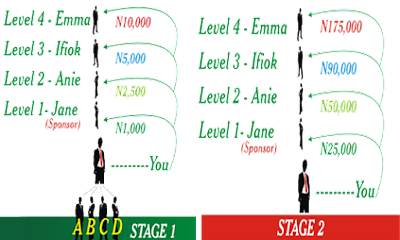 When you give Jane [your sponsor] N25,000 naira for level 5, you will receive N100,000 from your 4 down lines. When you give Anie N50,000 for level 6, you will receive N800,000 from your 16 persons. When you give N90,000 to Ifiok [your third person], you will receive N5,760,000 from your 64 persons. And finally, when you give N175,000 to Emma for level 8, you will receive N44,800,000 [Forty four million eight hundred thousand Naira] , and then you circle out. You can choose to get into the system as many times as you like. If you have any question, feel free to use the comment box below.